05-19 Chrysler 300, Dodge Charger, Challenger, Magnum Hawk HPS 5.0 Front Brake Pads. Hawk - HB509B.678 HPS - High Performance Street disc brake pads are world renowned for increasing stopping power on your street legal vehicle. Hitting the Rev Limiter just took on a whole new meaning with Hawk Performances High Performance Street 5.0. For years engine builders have been pushing motors to the limits of their ability, and at Hawk Performance we continue to get one step closer to the ABS Rev Limiter. High Performance Street 5.0 is one step closer to giving you the greatest stopping power and pedal feel for your vehicle without compromising your ABS. Too much Brake Torque and your ABS goes into ICE mode, too little and there is no improvement to the product. Pedal feedback, Noise, Brake Torque and Dust control was our goal with High Performance Street 5.0. Not a replacement for our current HPS product, but a change that allows the driver to challenge themselves and their car with a new and unique driving feel. Hawk Performance High Performance Street 5.0 Pads offer more stopping power and get resistance to brake fade, elevating your street cars performance. 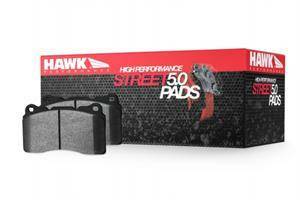 This makes them more responsive and durable than most standard original brakes and makes Hawk Performance High Performance Street 5.0 Pads the best choice to increase your braking performance and reliability while being both cost conscious and Made in the USA.